Pilates has been around for almost a hundred years, but some people still have the question "What is Pilates?" Pilates is a series of exercises developed by the late Joseph Pilates in the early 1900's. 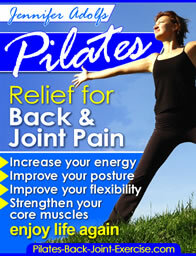 Pilates exercises originate from yoga, gymnastics, and animal movements. 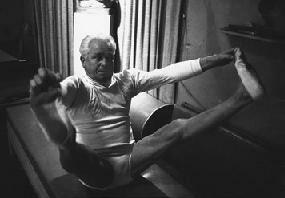 Joe Pilates loved to study how animals move and stretch and even named some of this exercises after them. Such as the "Cat", "Swan Dive", "Seal", and "Clam". A good Pilates routine includes the principles of breathing, concentration, precision, focus, exact and flowing movements. These principles are epitomized in the beauty and concentration embodied in the teaser shown here. Pilates exercise is unique from other movement forms in that it works our muscles from the inside out. Get your Pilates Ebook here today to get started on your own Pilates Routine safely and effectively and find out more about what is Pilates. Good Pilates Instructors cue the student to create space in the body, in particular between the ribs and hips while flexing, bending, and rotating the spine. Such as in the Spine Twist shown below. Finally, good Pilates routines incorporate learning to stabilize the core, everything from the shoulder girdle complex to the pelvic girdle complex and everything in between. 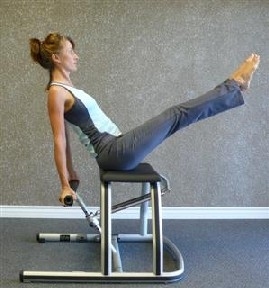 The Pilates Leg Circles, as shown here to the left are a good example of stabilizing the pelvic floor muscles as well as the shoulder blades, while freely mobilizing the thigh bone to rotate in the hip socket. We stabilize the shoulder blades for freedom of arm movements and better range of motion. This also helps to prevent injuries to the joints. When we stabilize muscles that support the spine we are better able to flex, side bend, and rotate the spine with less risk of injury.